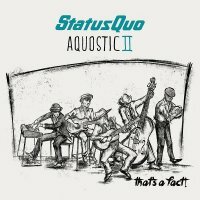 When Status Quo announced that they were releasing an acoustic album, there was some skepticism. 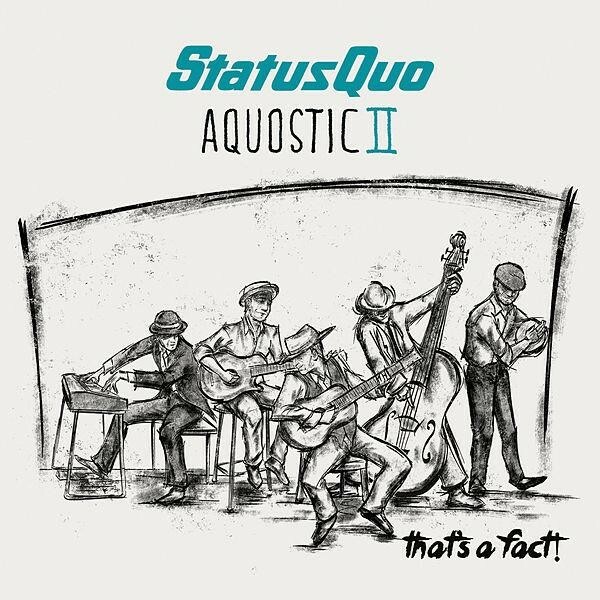 Yet when 'Aquostic' landed in 2014, it turned out to be a massive success, hitting the Top 5, going Gold and being Quo's best-selling album for eighteen years. Taking beloved songs and re-working them unplugged, with accordions, strings and female backing singers, showed the hit singles and some deeper album cuts off in a brand new light. With anything successful, a sequel is usually demanded and as a result 'Aquostic II: That's A Fact!' is the result. Quo wisely haven't strayed too far from the formula that made the first album so popular. New workings of anthems like 'Backwater', 'In The Army Now', 'Dear John', 'Hold You Back' and particularly 'Roll Over Lay Down' sound great with their new arrangements, while other tracks have been selected which are less obvious. The title track is a great opener, one I must admit I'd mostly forgotten from 'Blue For You'. The band also cover a variety of eras, going right back to their early years with 'Ice In The Sun', thought to picking 'Lover Of The Human Race' from the underrated 'Thirsty Work' album from 1994. More recent fare like 'Belavista Man' from 2005's 'The Party Ain't Over Yet' gives Rick Parfitt chance to take over from Francis Rossi on the vocals. 'Jam Side Down' from 'Heavy Traffic' is another choice cut and the album rounds out with 'Resurrection' from '1982'. In the interests of keeping things fresh, two new songs, 'One For The Road' and 'One Of Everything' are included on the standard release – penned by keyboard player Andy Bown – both of which are very good and nestle comfortably next to the more familiar material. As well as a standard fourteen track release, there is also a "deluxe" version, which adds another new song, Rossi's 'Is Someone Rocking Your Heart' alongside acoustic renditions of 'Lies', 'Little Dreamer', 'Living On An Island' and 'Rockers Rollin'. The deluxe version also adds a second disc with six live tracks from their 'Aquostic' show in Stuttgart. Fans also need to be aware that there is a limited edition double vinyl release too, which omits the deluxe live tracks, but has all nineteen album tracks and adds one additional one, 'For You'. If you enjoyed 'Aquostic', I see no reason why you won't love 'Aquostic II' just as much. Excellent!